When was the last time you saw a football or cricket match where the players were messaging or checking their Facebook page in between playing? The thought of a sportsperson pulling out a phone to check a Whats app message or Facebook status update seems ridiculous. Why? Because its obvious that checking your phone in the middle of batting (even between overs) would break your concentration and focus and you will not be able to perform at your best. Now why is this any different to what we do as doctors? We dont think twice about checking a message in between or even whilst reporting a case, listening to a talk or reading a journal. Our phones go off whilst doing intervention cases and even if we dont answer it, it breaks our concentration and focus. 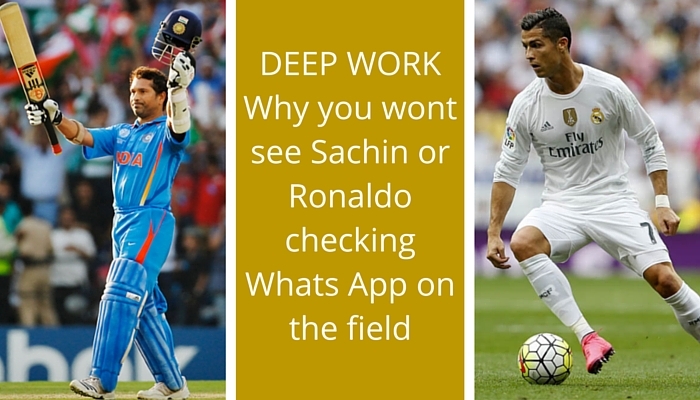 What sportspeople do is a great example of Deep Work that we see every day but never think that it should apply to the work that we do. There have been a couple of books that have had a very big effect on how I work, learn and organise my life. One of the most useful and most practical books I have read is Cal Newport’s new book called Deep Work: Rules for Focused Success in a Distracted World. 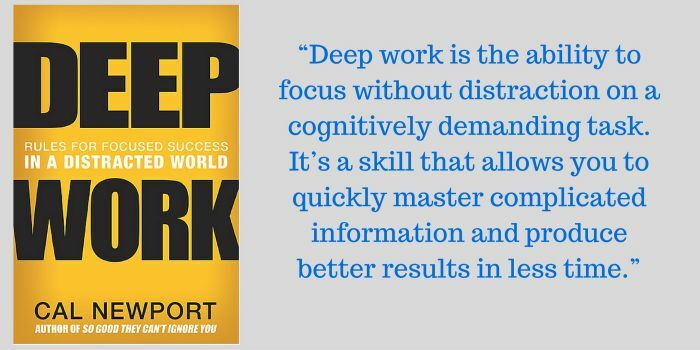 Deep Work is a term he uses for focused concentration, without distraction, on things that demand a lot of mental effort, things like learning something new, writing a paper, reporting a scan or doing a procedure. Focused concentration that isnt distracted by calls, email, text messages and status updates which even if momentary, reduce the effectiveness of your concentration and attention to what you are trying to learn or working on. In the radiology setting our workplaces and workflow are generally not designed to produce distraction free work. Phone calls, interruptions from techs, receptionists and clinicians all cause constant disruption to focused concentration on reporting. One answer to this would be to have time dedicated to reporting without any interruptions. In one of the hospitals I worked in, there was a two hour period in the morning and again in the afternoon where the doors were locked and phones diverted and no interruptions permitted to reporting. This worked extremely well and was well accepted by the clinicians. But unfortunately most places are not like this and allow constant interruption. If football players are expected to play without distraction, why cant our workplaces be set up for periods of distraction free reporting, which is far more important. When we are learning new things its often in a non structured way with no or limited focus and concentration. As doctors and radiologists we are all knowledge workers where the ability for Deep Work is essential. Our value is in our knowledge and our ability to constantly improve it. His book makes a case that the ability to focus and concentrate deeply is becoming increasingly rare in our society, and that those who have this skill will be more productive, sought after and rewarded. This is one of the most useful books I have read and one of the great things about this book is that its extremely practical. Its not just theories and academic talk but he gives various very effective ways of reducing distraction and increasing focus and productivity. I would highly recommend it if you are interested in your own productivity and in improving your concentration and focus and the effectiveness of your work and learning. His blog is at this link.